I have been meaning to do this for sooo long. And what better day to do it than Thanksgiving Morning! And yes. I'm thankful for a LOT. 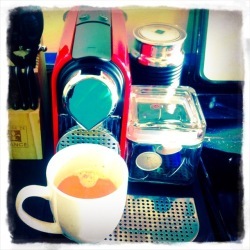 But in my 'minor list of thankfuls' I have my tasty Nespresso machine there. -- Unfortunately, I noticed they don't sell ours anymore! Strange. I have the 'middle sized one'. Cause having the milk 'frother' was the ONLY reason I bought it. 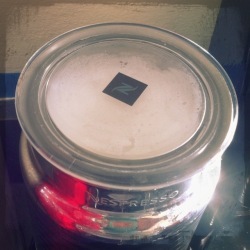 -- The capsules you have to buy from Nespresso aren't cheap. Think about it though. I spent an average of $4 for a coffee at Starbucks. That's $20 a week. That's over a $1000 a year!! Geez. That's insane. The capsules run around 60 cents. It's worth it. Bottom Line. -- You have to order it and have them delivered. You can't just 'buy the capsules' at the store. That is a pain in the arse. Especially if you run out and you're dying for a cup. -- There is a huge array of flavors to choose from. -- They don't sell ours anymore. I know. I already said that. But that's a major dealbreaker!! The frother is the best. If you want to invest in the BIG BIG one....then you're good to go. But that's a LOT of money. Yes. I love our machine. No. I wouldn't have bought it if it didn't have a frother. But I looked at Keurig and all the other options and just didn't like them like this. I'm a coffee snob. I thought those others taste was cheap. So, if you don't care about your coffee-then by all means get any of those other ones cheaper. BUT-if you are a connoisseur of coffee-then GET THIS!!! Worth it. **FYI-we paid for this 100%. It wasn't a freebie. But I really thought I'd share my thoughts!